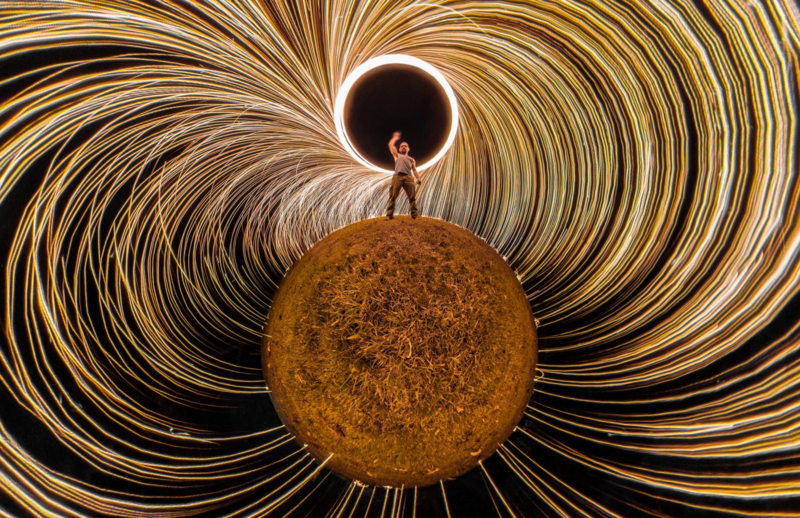 As a recap for those of you who may have been as oblivious to steel wool's photographic effects as I was, this effect is achieved simply by swinging a ball of steel wool, lit with a lighter or battery, attached to a whisk or something similar. The image in higher resolution (click to zoom). The camera I have is the Insta360 ONE. To do this shot I placed the camera on the ground about 2 metres away from me and set it to a 15 sec countdown timer which gave me time to find my position and have the steel wool burning and spinning by the time the camera shutter released. This is a 20 sec exposure. I took the image and distorted it in 'Insta360 Studio' to produce the tiny planet effect. Before all of you go out to try this, keep in mind that this requires loads of safety precautions. Sparks from steel wool will typically burn out within seconds, but sometimes it'll take several minutes if a chunk comes off. In some cases, the sparks can become embers, which can remain in slow burn for several hours. That means that you'll have to wait at least a few hours to make sure nothing catches fire, and you should bring a fire extinguisher with you. On top of all that, there are loads of burn bans around the country, so make sure you're not violating any laws. There are more precautions I'm missing, but tl;dr: do your research before you go out and do this. Do things safely, and you just might end up with something as cool as this without burning anything down.